If you have an elderly parent or children at home alone, you'll get some peace of mind knowing that they can access help if needed with just a press of a single button. The HAI Panic/Alert Pendant comes with a handy neck strap and can trigger the HAI OmniLT, Omni II or OmniPro II automation controller (all sold separately) to send out a call for help if necessary. The HAI Panic/Alert Pendant sends its signal to the HAI Wireless Receiver (sold separately) to activate automation programs in the HAI controller. 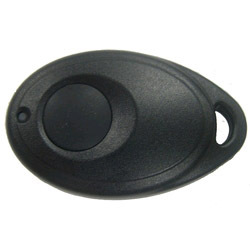 The HAI Panic/Alert Pendant is a single-button supervised remote that can trigger outgoing phone calls to up to 8 different numbers, an e-mail notification, or video surveillance recording, depending on how you have your HAI system set up. The HAI Panic/Alert Pendant is powered by lithium batteries, which come pre-installed on the pendant.